Milwaukee Water Works employees repair city pipes. Clean drinking water has become a topic of conversation throughout the U.S. - from arid states worrying about sufficient quantities, to rust belt cities grappling with failing infrastructure and old lead pipes. While the Great Lakes represent one of the world’s largest freshwater systems, its cities are not immune from concerns about drinking water. "Milwaukee is the cheapest of the 6 cities APM Reports analyzed in the midwest. 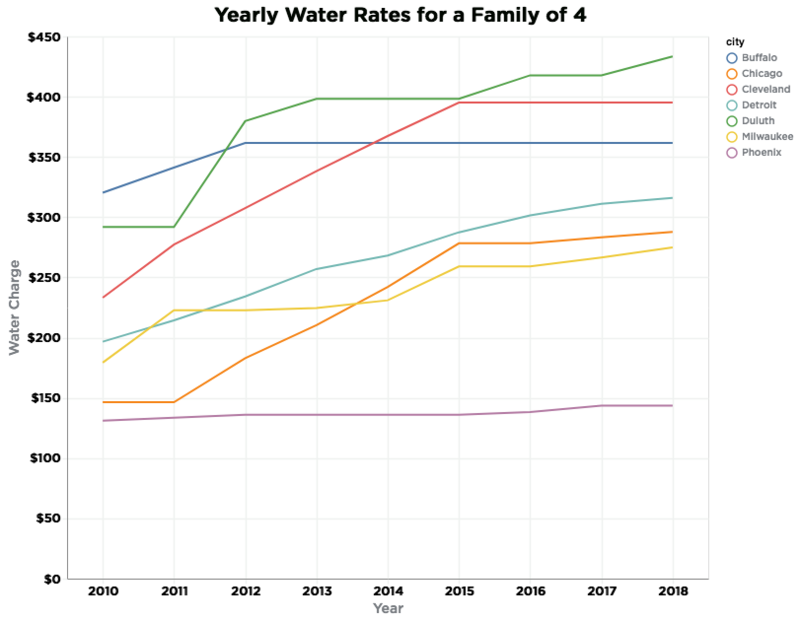 From 2009 to 2018, water rates increased by about 100 dollars, from about $175 to $275 per year for a family of four," Will Craft, American Public Media Reports. American Public Media and Great Lakes Today investigated water rates and reported that in recent years water rates have doubled in Cleveland and Detroit. Chicago’s rates have nearly tripled. So what about the price of water in Milwaukee? The City says an average family of four pays around $233 a year for city water. That compares to $145 a decade ago. That’s definitely an increase, but compare it to Detroit, Michigan. Its rates have almost doubled and in some cases, the city has shut off families’ water supplies when they’ve failed to keep up with payments. According to the American Public Media report, in 2014 Detroit’s shutoff rate was so high, the United Nations called it a violation of human rights. Milwaukee’s utility says it does not cut off service, as long as city workers can access the water meter for maintenance or replacement. Instead of shut-offs, the city tacks the delinquent water bill onto their property tax bill. Water policy expert Lynn Broaddus worries that shut off - or no shut off - the state of Milwaukee’s infrastructure puts all of its customers at risk. Broaddus runs a consulting business based in Minneapolis. "Milwaukee for the last couple of decades has tried hard to keep its water rates low, to make it affordable both for its residents and its industrial and commercial clients," Broaddus says. She notes that policy has come at the detriment of tending to increasingly fragile water infrastructure. "When you think about the capital assets that lay beneath the ground and in our pumping station and all that, there were huge investments that were put in long ago to build that infrastructure," Broaddus explains. "Since that time, and this is not just Milwaukee this is true in a lot of cities, we’ve been paying to fix it here and there but not putting that huge investment." She suggests it’s time for Milwaukee leaders to act. "In order to take on the capital needs that are now facing the City of Milwaukee for its water infrastructure, it’s estimated that their capital budget is going to double in fairly short order. And in order to do that they’re almost certainly have to turn to low interest bonds in order to come up with that capital and not completely strap the current day rate payers," Broaddus says. In 2017 the Public Policy Forum scrutinized the condition of Milwaukee’s vast sea of water mains, service lines and treatment plants. The group concluded that the system faces mounting challenges – based on the age of the infrastructure and the emergence of the city’s lead service line issue. That issue consumes Brenda Coley, co-executive direcor of Milwaukee Water Commons. The organization is committed to educating the community about water and to advocating for residents’ voices in water policy. "At the moment that’s not the biggest issue for Milwaukee. When you look at it from a public health perspective we want to reduce the risk – we can’t eliminate it, I understand that – but we can reduce it. But until we come up with the WILL to replace these lead laterals, I think we need to get 70,000 filters on 70,000 homes," Coley says. Milwaukee leaders say they are grappling with the cost of addressing lead pipes along with the City’s other infrastructure needs. In the meantime, they say progress is being made. In 2018 the city replaced 18 miles of main and 910 lead service lines. This year it expects to increase lead service line replacements. The City of Milwaukee health department is under fire -- amid a management shake-up. It became public Friday afternoon that the department failed to properly notify thousands of families, whose children tested positive for elevated blood lead levels. It also became public that health commissioner Bevan Baker has left his post.